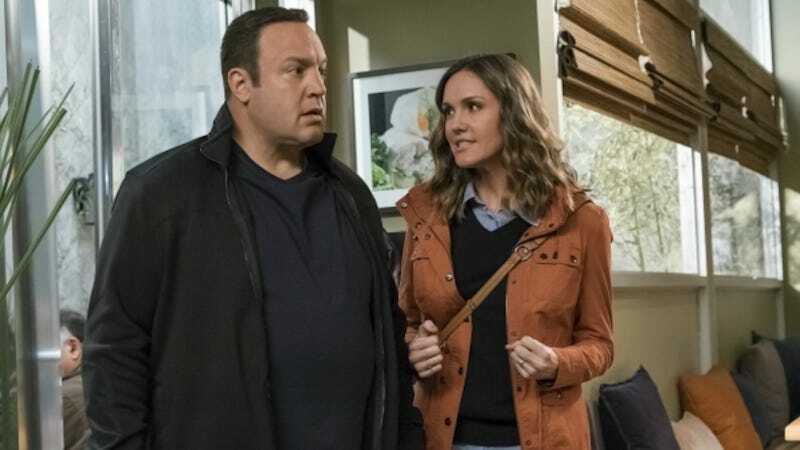 CBS’ decision to kill off the wife on Kevin Can Wait—Erinn Hayes’ character—has led to a combination of shock and intrigue both from fans and non-viewers. That will continue to be the case even as the show’s creators try to explain why this is happening. Donna’s death was seemingly a foregone conclusion that serves to refocus the story around Kevin’s struggle to recover as a single dad post-tragedy. The move also, of course, functions to reunite Kevin James and Leah Remini. Donna had to die so that King of Queens could live again. By the time the series returns on September 25, Donna will have been sacrificed, but it’ll be in a respectful way. Executive producer Rob Long said, via TVLine, “...Out of respect for the character of Donna—and certainly the way that Erinn Hayes portrayed her—it seemed like the only right and fair way to treat her character.” The only? Asked whether they ever considered reshaping the series in Season 2 to focus solely on Kevin’s professional life (and thus letting Donna live, albeit off camera), Long says that simply was not in the cards. The “nucleus of the idea,” he shares, was “Kevin being a single father… [We] were really attracted” to watching Kevin “learn how to do all of the stuff” that comes with being a single parent to three kids — four if you count Kendra’s fiancé Chale.